First in the series of our step-by-step guides to searching SynagogueScribes and getting the best results. In SynagogueScribes, using basic search which is the search present on every page of the site. The results will cover all the sources, births, circumcisions, marriages, burials. Produces 15 results, of which the last BSGSBUR32 102 is a match. Note the very slight discrepancy between the dates, probably due to variations on whether these refer to the date of death or the date of burial, and occasional imperfections in the calculations between the Hebrew and the English date. 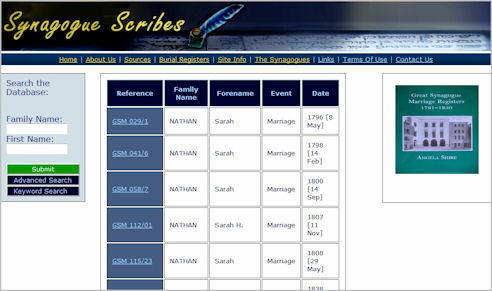 Looking for a Synagogue marriage for Simon Magnus [1851 6, New Street, Saint Botolph Without Bishopsgate RG number: HO107 Piece:1524 Folio: 670 Page: 7] with wife Julia and Father Nathan. Produces one result GSM 222/15. But this cannot be the correct marriage. Why? Because, apart from the fact that this groom’s bride is Sarah, the father in this record is Eliezer. But don’t give up yet. Why not try an alternative spelling for either Family or first name. Over the coming weeks, we will look at more complex searches. Meanwhile, we hope you enjoy using both our databases and that they help advance your family history.